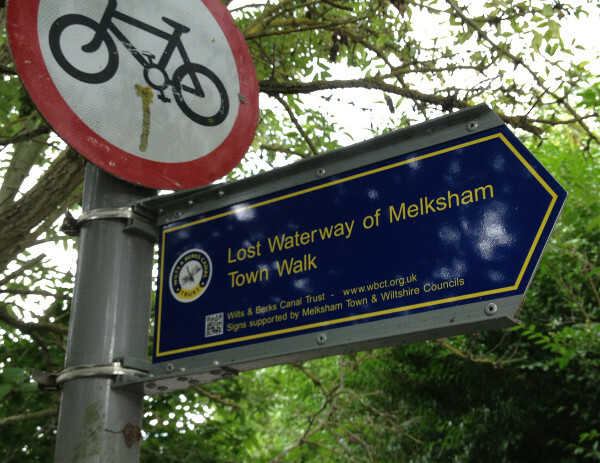 Welcome to our town of Melksham, Wiltshire! writing in progress by Graham Ellis - who moved here 20 years ago, and loves the town. "Can you spell that, please?" ... a common request over the phone when you tell someone you're from Melksham. It's a quiet town that's very much kept itself to itself for the last many years, nestling in the beautiful scenery of Central Soutern England, yet bypassed by most who rush through our county of Wiltshire on the M4 towards Bristol and South Wales, or on the A303 on their way to Devon and Cornwall. It's the same for rail travellers too - three main lines bisect Wiltshire from East to West - the line from Paddington via Swindon at the top of the county, the line from Paddington via Westbury in the middle of the county, and the line from Waterloo via Salisbury in the south of the county. Only the TransWilts line - for part of the way a single track with a chequered history - runs truely from north to south, linking up the modern almost-industrial almost-Midland metropolis of Swindon in the north with Salisbury - a Cathedral City that can trace its roots back even to BC years - in the South. 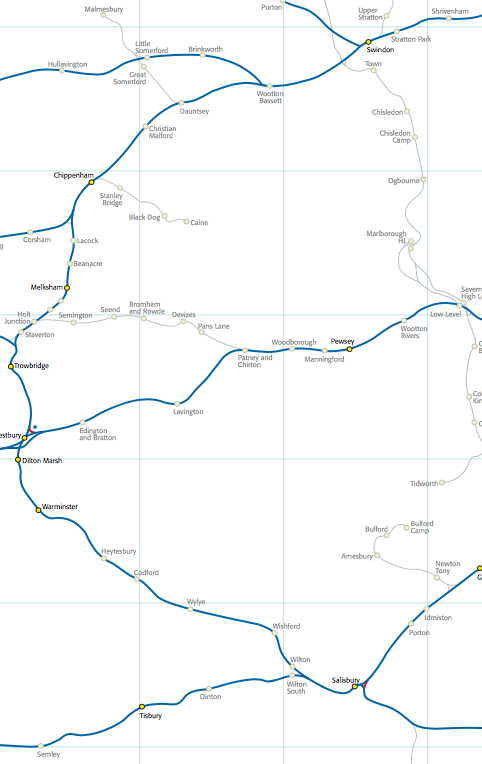 And between these two, the arc of the TransWilts passes through Chippenham and Trwowbridge, Westbury and Warminster, and Melksham. Ah - Melksham. Even within a county that's so modest about what it has to offer that people rush past, Melksham is modest in shouting about itself. The bypass (as these things are designed to do) keeps traffic away from the town. The railway sneaks past the town on the opposite side of the river to the centre, our regional trains pausing at a humble platform at the end of the industrial estate for a couple of minutes while a suprising number of people get off and on - and that's what Melksham is - a surprise to our visitors. And we hope a pleasant one. One snowflake is a prize of great beauty but a surfeit of snowfalkes will drift and prevent people living their daily lives. Visitors to Melksham are like individual snowflakes - greatly cherised, admired, thanked for coming and - we hope - made very welcome. As you arrive by train (you are arriving by train, right, as this is the Rail User Group website) you may wonder for a couple of minutes just what you have let yourself in for; it isn't - yet - the prettiest station. But very soon you'll find you're taken into the physical and emotional heart of the town that I moved to nearly 20 years ago - having been bypassing it because of the physical transport layout - for the previous 20. And I'm living here to stay. Let me tell you a little more of Melksham. 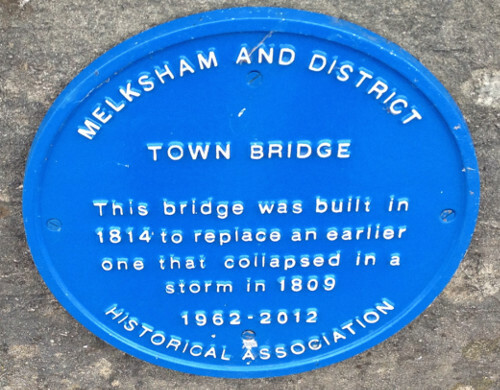 Melksham is a town with a long history. Originally a ford across the river Avon and a Saxon settlement, the name is believed to be derived from Meolcham, “Meolc” being the old English name for milk and “ham” a village. So as you might expect, the area has been long associated with dairy farming and pasture. It remained just a village for many years and had its fair share of royal property owners, villains and entrepreneurs. Around the early part of the 13th century, King John and other kings enjoyed hunting, often visiting Melksham Forest. In 1220 oaks from the forest were used in the choir stalls in the new Cathedral at Salisbury, as part of the parish of Melksham was endowed to support the Canons of the Cathedral. 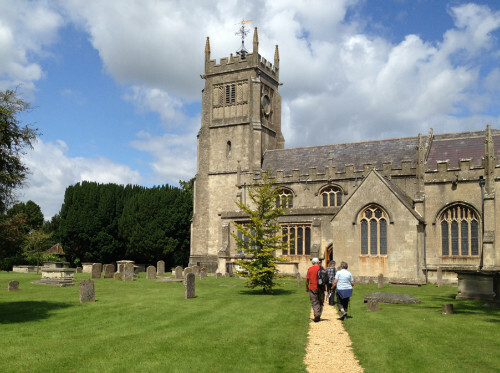 The Abbess and the nuns of nearby Lacock Abbey had the right to a specified amount of wood from the forest. This resulted in the forest being almost completely destroyed by the early 17th century, though the area is still known as Melksham Forest . Medieval settlement seems to have been concentrated in Church Street, Church Walk, High Street and Market Place. Fulling mills were working at Melksham by the 16th century and perhaps earlier so there would have been a small settlement near the river. The main Avon river bridge is first mentioned in 1415 when a sum of money was bequeathed for its maintenance. 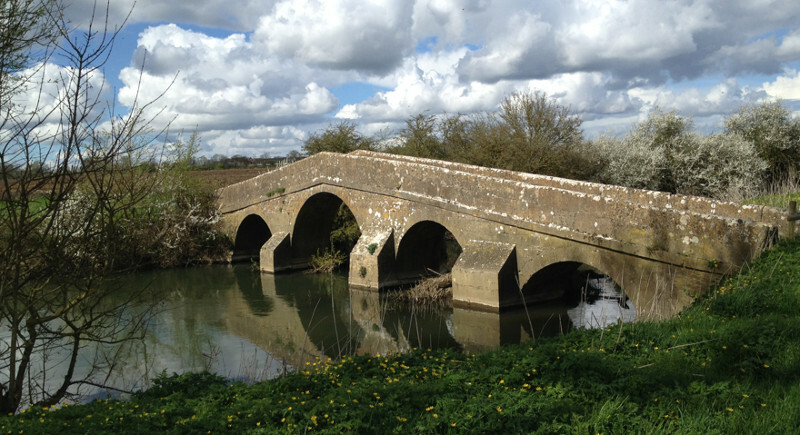 Lowbourne bridge, across Clackers Brook is mentioned in 1417. By the middle of the 14th century Melksham was a busy weaving town, the chief product being white broadcloth. This industry provided employment for spinners, weavers, fullers and shearmen. But by 1838 only two cloth mills remained beside the Avon, both operated by steam power and employing 162 workers. The last working mill, The Matravers Mill, was auctioned in 1888 and is now incorporated into the Cooper Avon Tire factory. The King’s Arms Hotel in the centre of Melksham was built in 1750 when the toll road route from London was altered, resulting in stagecoaches from London passing through Melksham on their way to Bath, Bristol, Exeter and Devonport. By 1830 there were six coaches each day carrying passengers to London. The Royal Mail and the Emerald stopped at the King’s Arms, the Royal Blue and the Regulator at The Bear, opposite what is now Union Street, and the Olde Company’s coach and the White Harte coach called at both. The four coach horses were changed every eight to ten miles so there ws probably stabling for about 50 horses behind these hostelries. The coaching days finished when the railway reached Chippenham around 1840; right up to 1926 visitors the King’s Arms had its own bus to collect visitors from Melksham station. The Wilts and Berks canal linking the Kennet and Avon canal with the Thames opened in 1819 and gave Melksham added importance. It ran almost through the centre of town. It was abandoned in 1914, though traces remain such as the Wharf House adjoining the hump that was the canal bridge in Spa Road. In 1813 several local gentry who had prospered from the woollen industry, the Awdrys, the Longs, the Methuens and the Phillips formed the Melksham Spa Company with a capital of 7,000 guineas to exploit the chalybeate spring discovered in 1770 to the south of Melksham. A well more than 300 feet deep was sunk and six semi-detached boarding houses and a hotel were built. The Spa was intended to rival Bath but within a few years it had failed. With the coming of the Great Western Railway from London to Bristol via Chippenham a committee was formed, chaired by Walter Long of Rood Ashton near Trowbridge, to raise money for a line line from Chippenham to Salisbury via Melksham, Trowbridge, Westbury and Warminster, with branch lines to Bath and Frome. Designed by Brunel it was to be known as the Wiltshire and Somerset Railway. The land was acquired, lines were laid and stations including Melksham Station were built, all for £1 million, and it opened to the public in September 1848. Earlier, in 1846 the railway contractors erected workshops in Melksham. The Cheese Market, built in an orchard acquired from the owners of Place House by the Melksham Market Company, was a particular attraction. This building later became the Town Hall. The 19th century saw the growth of many industries in Melksham. In 1803 Charles Maggs bought a former cloth mill adjoining Spa Road and used it for making rope, matting and tarpaulins. A subsidiary factory was built at Alleppey in southern India, and the business flourished right through two World Wars with two shiploads of matting coir arriving in Melksham every month. It eventually declined and the Rope Walk housing estate now commemorates the business. In 1850 Benjamin Sawtell founded a business in Challymead, on the Bradford on Avon road, filling palliasses with straw for the army. By 1875 he had moved to a disused cloth factory in the Town. In 1892 he began purifying feathers for pillows and eiderdowns. Feathers were imported from all over the world and in the 1960s it was one of the largest feather firms in the country. Unfortunately man-made fibres began replacing feathers and the Weavers Croft housing estate was built on the site. Today, one of the the largest employers in Melksham is Cooper Avon Tires, previously Avon Tyres, a rubber company in Limpley Stoke between Bradford on Avon and Bath, making special parts for the booming railway companies. In 1890 it took over the last cloth mill in Melksham, the Matravers Mill alongside the river Avon and changed its name to the Avon India Rubber Company. The factory buildings now cover more than 28 acres. It was taken over by the American tyre company Cooper at the turn of the century. 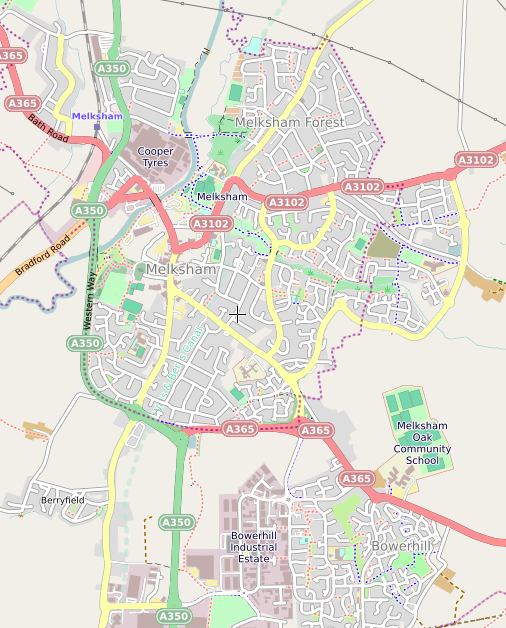 Melksham is well known to many members of the Royal Air Force who learnt their trade at RAF Melksham, which at its peak accommodated over ten thousand personnel. The official title of the station from when it opened in 1940 until it closed in 1965 was No.12 School of Technical Training. Many local people remember seeing aircraft on display at the annual open days, but it was never an operational flying base because it had no runway. The aircraft were used for training purposes for ground crew and technicians and were dismantled before arrival and departure. The station also housed No 10 School of Recruit Training and it averaged an intake of 100 a week of mainly National servicemen until August 1953 when the last trainees passed out and the unit closed. Melksham lost its railway station in 1966, like many others under the "Beeching Axe". The line, once a proud double track secondary main line, was reduced to a single track sleepy freight backwater with the occasional diverted passenger train. Station demolished a couple of years later. Melksham remains a bustling and friendly place true to its proud trading traditions although housing estates have extended the town’s limits. The original core alongside the ancient parish church of St Michael still survives as a corner of quiet charm. The church carries traces of Norman work and there are some interesting tombstones in the churchyard. 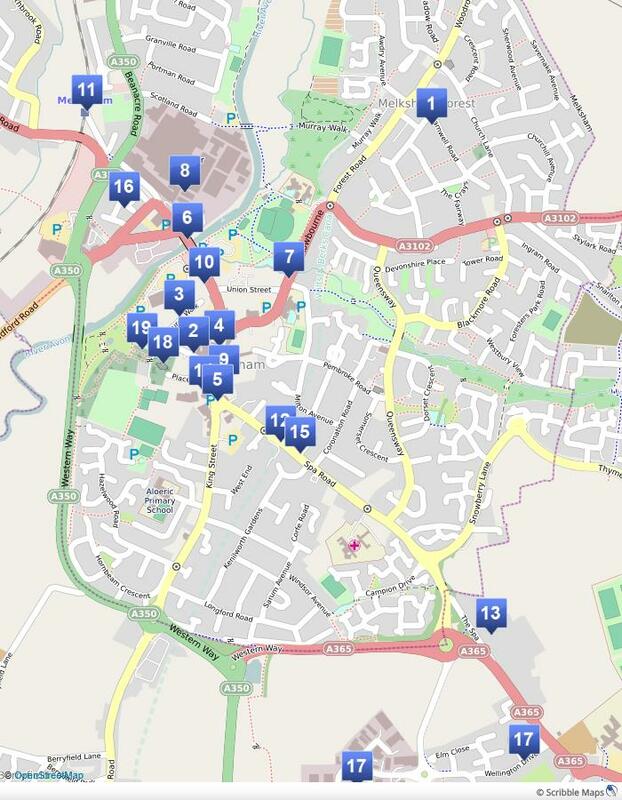 The current (2019) population of the settlement that makes up Melksham - adminsitratibely a combination of Melksham Town and Melksham Without Parish - is around 25,000, and of the wider area including villages which look to Melksham as their hub is around 30,000. And that makes the town the fifth largest settlement in Wiltshire - after Swindon, Salisbury, Chippenham and Trowbridge. And the town continues to grow, with new housing especially towards the east and south. The neighbourhood plan, which is wending its weary way through the process for such things, calls for a thriving, mixed use town centre. 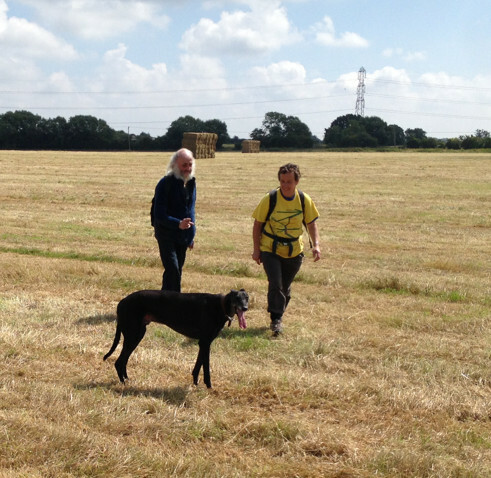 It calls for porous housing development to continue to knit the various communities together, with space reserved for an Eastern bypass on the trunk A350, and for a developing transport interchange and hub (Ask the Melksham Rail User Group and TransWilts) at the station. Business areas at Bowerhill, Hampton West and Challeymead provide a wide variety of employment, and Copper Tires is still a major employer, though it's shrinking at present as tyre production moves away. Lots of people work in the Town Centre too, and our is an enterprising population with all sorts of small and home businesses scattered around. There's a great deal of commuting - both inward and outward - with Bath, Chippenham, Swindon, Trowbridge and Corsham all being popular places to work. The town prides itself on its floral displays which make shopping a pleasant experience. At Christmas the lights are outstanding and some of the local roads get mentions as top places to see lights. 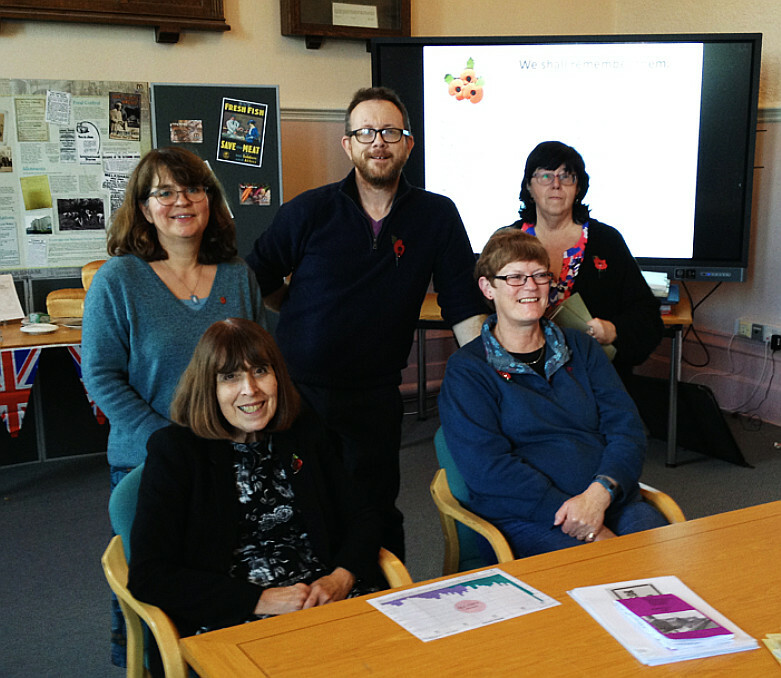 So much about Melksham is about the people and about joining in!